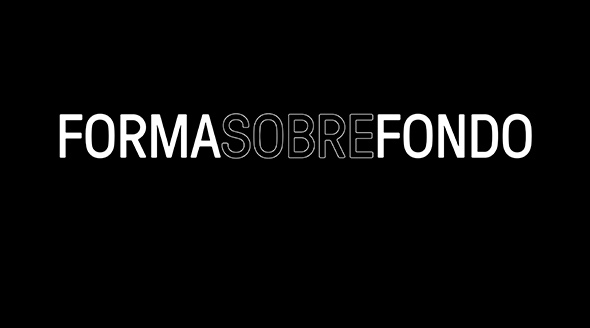 The exhibition FORMASOBREFONDO proposes a review of contemporary formalist aesthetics. This group exhibition is grounded in the dissolution of the formalism/conceptualism dichotomy. The title is a play on the schematics of modernist visuality of figure and ground, in this sense it is a tautological text in that it illustrates the exhibition’s conceptual framework when the letters in the title organize themselves into “formas sobre fondo” [forms on a ground]. Through this wording, the exhibition reveals the thinness of distinction between forms and concepts—abstraction and syntax. As much in philosophical currents as in artistic ones, formalism has been linked to romanticism, the aesthetics of idealism, and the dictum l’art pour l’art [art for art's sake]—coined by Victor Cousin and Edgar Alan Poe—as well as diverse trends in geometric abstraction. At its beginning it was a movement that opposed realism—or the imitation of nature—to re-vindicate a model of aesthetics subject to the bourgeois revolution of the 19th century, and that with time would derive multiple variants of the Kantian maxim that would understand art as a selfless (reflexive) activity, an aim without end. At the end of the 19th century, formalism established the footing for the advancement of scientific historiographical methodologies linked to the emergence of logical positivism. Situated within the context of the so called Vienna School, this model of theorization supposed the edification of an autonomous disciplinary field, or a historiography, that was not contingent upon politics, religion, or economics but, rather was of it’s own object or concept: the experience of the formal in artistic objects. Developed by theorists such as Fiedler, Von Marées, Riegl, Hildebrand, and Wölfflin through Gombrich and the American Greenberg, the diverse aspects of formalism united in the staunch defense of the autonomy of art. During the 20th century the historiographical formalist principles, that suggested that the study of the evolution of forms be an activity specific to its own discipline, were called into question by a shift in linguistic theory which occurred hand in hand with Saussurean semiology, structuralism and hermeneutics, among other models of critical thinking oriented towards Marxist theory and psychoanalysis. During the middle of the twentieth century formalism began to be challenged due to its apparent distance from social realities. What began as a dilemma in Hegelian philosophy that understood art as a sensitive manifestation of the spirit (concept) in counter-position to form, today is mistakenly understood as a negative or “superficial” position. With the arrival of post-conceptual art in the 1990′s, artistic methodologies multiplied, creating a chorus of heterogeneous voices whose global dissonance is informed by constructivism through minimalism; not unlike analytical conceptual art and many other forms of aesthetic politicization that developed after 1968. In this atmosphere of aesthetic theorization we have forgotten that other theories related to linguistic constructivism and the history of image production derive from formalism; which is why its initial impulse today is subsumed by the degree to which its autonomy is open to cultural production and visuality.